There was at least one important reason for the 200 or so rollerbladers in the Mankato East parking lot to listen when Emmanuel Savage was speaking. 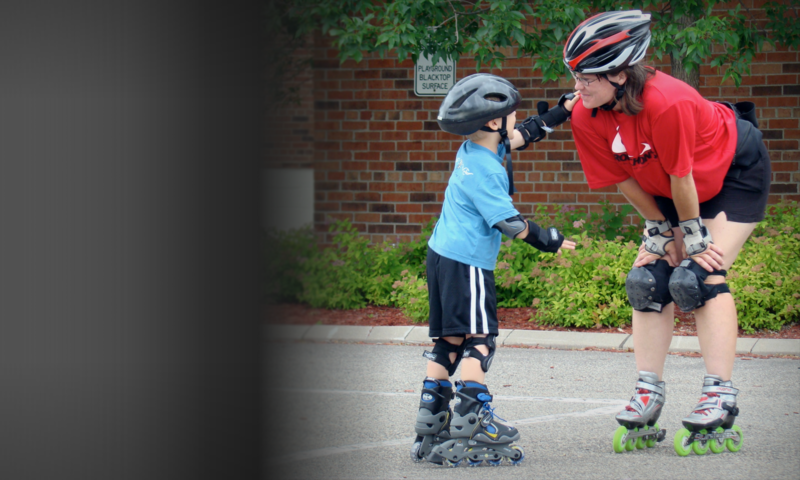 The Robichon skate clinic will help individuals learn how to inline skate or improve skating. Before you learn to execute a trendy double push, complete a two-footed heel spin on five wheels or glide 26 miles in an in-line skate marathon, you first must past the Sneeze Test. Or at least you do if you’re an aspiring 5-year-old enrolled in a summer camp at Robichon’s, a 9-year-old Minneapolis in-line skate school company that teaches everything from the basics of learning to stop to the latest dance moves on wheels. School founder and master instructor Noelle Robichon’s audience at an Edina park one day this week was eight eager skaters ages 5 to 8. One of the afternoon’s first lessons: That sneeze test, in which Robichon feigned a big sneeze, flapped her lips and shook her head vigorously, encouraging her young skaters to do the same. She has seen the in-line skate industry go from its boom times of the late 1980s and early 1990s into a decline in skate sales and participation that she hopes will begin to spike again with the possible inclusion of in-line skating at the 2008 Summer Olympics. Participation grew 850 percent from 1989 to 1998, has dropped 20 percent since then but still includes more than 26 million annual U.S. participants. She now travels the metro area and the state in her pickup truck, pulling a 10-foot trailer filled with skates of all sizes, ramps, hockey sticks and well-used knee pads and wrist guards to city playgrounds and regional trails, where she teaches from two to six classes a day. The beginners learn the basics. Advanced skaters learn such moves as the double push, the latest racing rage that allows skaters to power off with both skates rather than just one at a time. She starts teaching from the ground up. From down on all fours, her young students learn they won’t get scraped if they learn to fall forward using their plastic gear to protect them against the asphalt. They move on to the basics of standing in powerful positions and from there, they move to the art of stopping: Shifting from a two-footed balanced position by sliding the brake foot forward while transferring your weight to your non-braking leg, then engaging your brake foot by putting pressure through your heel. From there, she said, skating gets into your soul.